Documentation for discontinued products can be found in the PIP Document Archive. For support (FAQ and Downloads) check the PIP8-1/2 support page. please check out our PIP8-11 with a Celeron M processor! PIP8 - Pentium III with 700 MHz and no Fan! The PIP8 is a highly integrated and robust Packaged Industrial PC with the low power Pentium III 700 MHz processor out of Intel's Embedded Program. 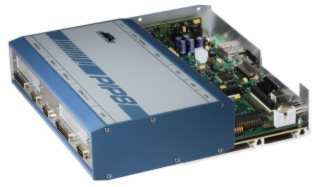 The PIP8 complements the existing PIP Product family (PowerPC and x86) that represents a unique solution for today's demanding industrial needs. PIPs are available in various options and are built into a extreme compact EMI/RFI sealed aluminum chassis. They can be operated under extreme as well as under normal conditions without the need of fans. Those features make the PIP8 the ideal and compact solution where high processing power, long availability, low power consumption and high quality is needed. The PIP IPCs are being used in telecom, medicine, vehicles, office, as well as in any industrial applications. Watchdog distinct keyed write sequence Programmable time out, 1 - 255sec. or 1 - 255min. For deployment in harsh environments, the PIP8 can be ordered in an extended temperature version. Every system needs to pass various tests in a environmental chamber to prove that it will perform flawless over the temperature range indicated.